Purpose: To warn that one-way street you are driving on will soon be crossed by a street that carries two-way traffic. Action: If you are driving in the left hand lane and want to turn to the right at the first intersection, change to the right hand lane in good time. 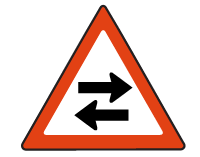 first intersection, change to the left hand lane in good time.